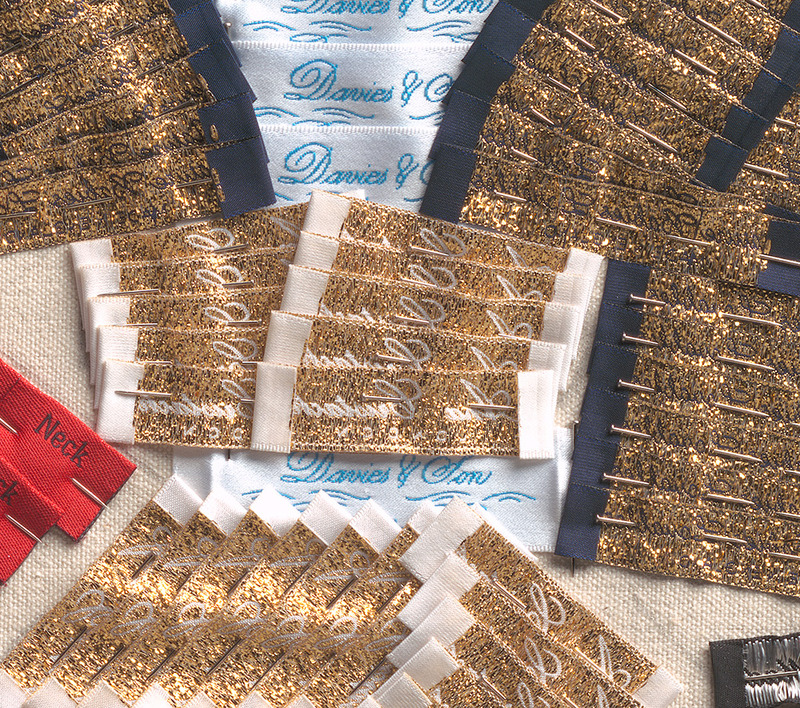 Woven labels include Davies & Son, 38 Savile Row and name tapes of 25 ships with dressmaker pins on canvas, 72 x 88cm. Capturing some key historic moments in the Napoleonic Wars, this portrait lists the 25 ships that Nelson served on as Midshipman, Lieutenant, Captain, Commodore and Admiral from 1770-1803. Admiral Lord Nelson was an early customer of Davies & Son (Est. 1803) and their bespoke woven label is pinned to the canvas in a temporary state, or ‘baste’, a tailoring term used for a first fitting. An impermanent pinning process and visual sketch reflects the handmade tailoring, pattern cutting and craftsmanship associated with Savile Row. The chelengk jewel gifted to Nelson by Sultan Selim III of Turkey and orders of chivalry and medals are reproduced in gold and silver metallic woven labels. It was Nelson’s desire to wear all of the honours that he collected during his lifetime, a true complement to his Royal Navy Uniform. The coat boasted blue-black wool cloth with a stand up collar, button-back lapels and a gold trim, a tailored masterpiece that certainly created the man. Savile Row Window Exhibition at Davies & Son, 38 Savile Row, London W1S 3QE from 30 November 2018 - January 2019.